Target is a game where you draw cards to try to satisfy the target cards. Each of the cards has a separate point value, and I wondered how ”true” those points were. So, my goal was to calculate the number of 6 card hands (in the game your hand limit is 5, but you draw a card and then can turn sets in) that satisfy each of the conditions and see if there was a way to derive how points were allocated. It was also a good excuse to calculate (using combinatorics) the exact number of hands that satisfy each condition, and to check those numbers using a Python script. Target cards are 0-9 in four different suits (purple, green, red, blue) plus 1 wild suit in each number. 0 and 9 have one of each suit and all other numbers have two of each suit for a total of 2(4 + 1) + 8(2 ⋅ 4 + 1) = 82 cards. The total number of possible hands is . 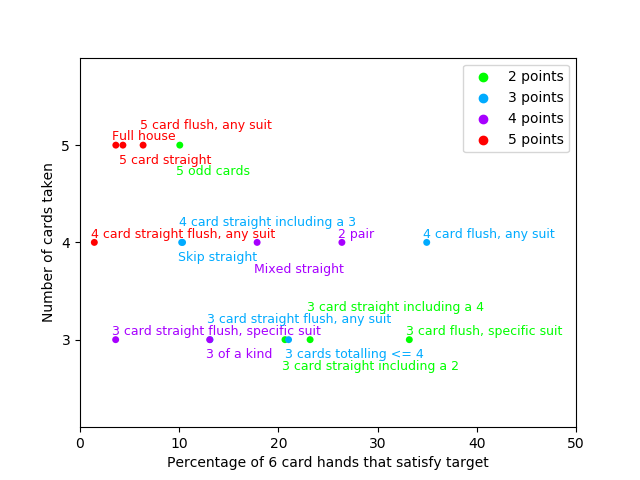 The x-axis represents the probability that a random 6-card hand will satisfy the target card. The y-axis is just the number of cards you have to turn in to fulfill the target card, and the color of the dot (and the corresponding text) is how many points it’s worth. So, dots in the upper-left hand corner are the hardest to get and take the most cards, and you would expect these to be worth the most points (which they generally are). One possibility is that the designers of the game looked at the probabilities with 5 card hands instead of 6 cards as I’ve done. Another is that they chose to fiddle with the point values to account for the fact that certain target cards are easier to turn in together - if you have 5 odd cards you have a pretty good chance of having a skip straight, etc. I was able to calculate almost all the results symbolically. Here are the results. Click on a hand type to see the derivation of that number. These results were derived by hand (except the ones in bold) and checked with a Python script. So the total is 376740 + 5307120 + 29299725 + 81257904 = 116241489. We break it down by the number of wilds in the hand. Note that there are 10 wilds and 18 cards of each suit, which means there are 54 cards not in a given suit. 0 wilds: There are 4 choices for the suit the flush is in, and in a given suit there are possibilities, which gives . 1 wild: There are 10 choices for which wild we have. We only need 3 cards in any one suit to have a flush, and since there are only 5 cards left we don’t need to worry about overcounting. So there are 4 choices for a suit and choices for the cards in that suit, which gives . 2 wilds: There are choices for which wilds we have. There are 4 cards left and we only need 2 of the same suit to make a flush, so only 1 card in each suit will fail to give a flush. There are 184 failures, so there are possibilities, which gives . 3 wilds: There are choices for which wilds we have, and any remaining set of cards will give a 4 card flush, so there are possibilities, which gives . 4 wilds: There are choices for which wilds we have, and any remaining set of cards will give a 4 card flush, so there are a total of possibilities. 5 wilds: There are choices for which wilds we have, and any remaining set of cards will give a 4 card flush, so there are a total of possibilities. 6 wilds: There are possibilities. So, the total is 19440384+53660160+41571630+7156800+536760+18144+210 = 122384088. Similarly, we break it down by the number of wilds in the hand. 1 wild: There are 10 choices for which wild we have, and 4 choices for the suit the flush is in. We need 4 out of the remaining 5 cards to be in that suit, so there are possibilities for those cards, which gives a total of . 2 wilds: There are choices for which wilds we have. We need 3 cards in any one suit to give a flush and there are 4 cards left so there is no danger of overcounting. Thus, there are 4 choices for a suit and choices for the cards in that suit, which gives a total of . 3 wilds: There are choices for which wilds we have. We need 2 cards in any one suit to give a flush and there are 3 cards left so there is no danger of overcounting. Thus, there are 4 choices for a suit and choices for the cards in that suit, which gives a total of . 4 wilds: There are choices for which wilds we have, and any remaining cards will give a flush, so there are a total of possibilities. 5 wilds: There are choices for which wilds we have, and any remaining set of cards will give a flush, so there are a total of possibilities. So, the total is 1924944+6952320+8482320+4357440+536760+18144+210 = 22272138. 6 card straight: For a 0-5 straight there are 5⋅95 possibilities, and for a 1-6 or 2-7 straight there are 96 possibilities for a total of 5⋅95+2⋅96 = 1358127. 5 card straight: For a 0-4 straight there are 5⋅94 possibilities and 82-5-9 possibilities for the other card (subtracting 5 for the cards used in the straight, and 9 because if the extra card were a 5 that would be a 6 card straight which we counted above). We’ve overcounted the cases where the other card is a 0-4, so we need to subtract out all straights of 0-4 where the card distribution is (2,1,1,1,1). If 0 has 2 cards there are of these, and if anywhere from 1-4 has 2 cards there are . So for a 0-4 straight there are possibilities. Using a similar technique, for a 1-5 straight there are 95(82 - 5 - 5 - 9) possibilities, but we overcounted the (2,1,1,1,1) distributions so the true number is , and for a 2-6 straight there are 95(82 - 5 - 9 - 9) possibilities, but we overcounted the (2,1,1,1,1) distributions so the true number is . This gives us a total of . 4 card straight: We use the inclusion-exclusion technique as described in the 3 card straight flush, specific suit case. For the 0-3 case our universe of cards is all 82 cards except any 4 (to avoid falling in the 5 card straight case), so there are 82 - 9 = 73 cards in our universe U. We get . For the 1-4 case our universe is all cards except any 0 or 5, so there are 82- 5-9 = 68 cards in our universe. We get . For the 2-5 case our universe is all cards except any 1 or 6, so there are 82- 9-9 = 64 cards in our universe, and we get , for a total of 5452920 + 7488828 + 6294186 = 19235394. 3 card straight: We use inclusion-exclusion again. For a 0-2 straight our universe is all 82 cards except any 3 (to avoid falling in the 4 card straight case), so there are 82 - 9 = 73 cards in our universe U. So we get . For a 1-3 straight our universe is everything except 0’s and 4’s, and there are 82-5-9 = 68 of these. So we get . For a 2-4 straight our universe is everything except 1’s and 5’s, and there are 82-9-9 = 64 of these. So we get , for a total of 14042295 + 17456634 + 13781016 = 45279945. So, the total is 1358127 + 6482268 + 19235394 + 45279945 = 72355734. 6 card straight: For a 0-5 or 4-9 straight there are 5 ⋅ 95 possibilities, and for a 1-6, 2-7, or 3-8 straight there are 96 possibilities for a total of 2 ⋅ 5 ⋅ 95 + 3 ⋅ 96 = 2184813. 5 card straight: For a 0-4 straight there are 5⋅94 possibilities and 82-5-9 possibilities for the other card (subtracting 5 for the cards used in the straight, and 9 because if the extra card were a 5 that would be a 6 card straight which we counted above). We’ve overcounted the cases where the other card is a 0-4, so we need to subtract out all straights of 0-4 where the card distribution is (2,1,1,1,1). If 0 has 2 cards there are of these, and if anywhere from 1-4 has 2 cards there are . So for a 0-4 straight there are possibilities. Using a similar technique, for a 1-5 (or 4-8) straight there are 95(82-5-5- 9) possibilities, but we overcounted the (2,1,1,1,1) distributions so the true number is , and for a 2-6 (or 3-7) straight there are 95(82-5-9-9) possibilities, but we overcounted the (2,1,1,1,1) distributions so the true number is . This gives us a total of . 4 card straight: We use the inclusion-exclusion technique as described in the 3 card straight flush, specific suit case. For the 1-4 case our universe is all cards except any 0 or 5, so there are 82-5-9 = 68 cards in our universe. We get . For the 2-5 (and 3-6 and 4-7) case our universe is all cards except any 1 or 6, so there are 82 - 9 - 9 = 64 cards in our universe, and we get , for a total of 7488828 + 3 ⋅ 6294186 = 26370846. 3 card straight: We use inclusion-exclusion again. For a 2-4 (and 3-5 and 4-6) straight our universe is everything except 1’s and 5’s, and there are 82 - 9 - 9 = 64 of these. So we get , for a total of 3 ⋅ 13781016 = 41343048. So, the total is 2184813 + 11324286 + 26370846 + 41343048 = 81222993. By symmetry this is the same number as 3 card straight including a 4, which is 81222993. By symmetry this is the same number as 3 card straight including a 2, which is 72355734. 6 card straight: For a 0-5 straight there are 5 ⋅ 95 possibilities, and for a 1-6, 2-7, or 3-8 straight there are 96 possibilities for a total of . 5 card straight: For a 0-4 straight there are 5(94) possibilities for the straight and 82 - 5 - 9 possibilities for the other card (we subtract 5 for the 5 cards used in the straight, and 9 because if the extra card were a 5 that would be a 6 card straight which we counted above). However, we’ve overcounted the cases where the other card is a 0-4. So we need to subtract out all straights of 0-4 where the card distribution is (2,1,1,1,1). If 0 has 2 cards there are of these, and if anywhere from 1-4 has 2 cards there are . So for a 0-4 straight there are possibilities. Using a similar technique, for a 1-5 straight there are 95(82- 5 - 5 - 9) possibilities, but we overcounted the (2,1,1,1,1) distributions so the true number is . For a 2-5 straight (and similarly a 3-6 straight) there are possibilities. This gives us a total of . So, the total is 1889568 + 8785179 + 5452920 + 7488288 + 2 ⋅ 6294186 = 36204327. By symmetry this is the same number as 4 card straight including a 3, which is 36204327. 6 card straight: To make a 0-5 straight, there are 5 ⋅ 95 possibilities (and the same number for a 4-9 straight), and for 1-6 there are 96 for a total of 2(5 ⋅ 95) + 3(96) = 2184813. So, the total is 2184813 + 12964536 = 15149349. 6 card straight flush: For a 0-5 or 4-9 straight there are 2 ⋅ 35 possibilities and for a 1-6, 2-7, or 3-8 straight there are 36 possibilities for a total of . 4 card straight flush: We could use a similar technique to the 5 card case (like we do in the 4 card straight including a 3 case). However, let’s try something different and use the Inclusion-exclusion principle. For the 0-3 case, our universe of cards is all 82 cards except for any Green 4 (to avoid falling in the 5 card straight flush case), so there are 82 - 3 = 79 cards in our universe U. Let A0 be the set of hands that don’t have a Green 0, A1 be the set of hands that don’t have a Green 1, up to A3 being the set of hands that don’t have a Green 3. Then what we want is the set of hands that satisfy none of A0,…A4, or , which by de Morgan’s laws is . Now, is the number of hands that don’t have a Green 0, which is , and the other ’s are . is the number of hands that don’t have a Green 0 or a Green i, which is , and the other ’s are . We continue on in this manner to find that the number of 4 card straight flushes of numbers 0-3 is (and by symmetry this is the number of 4 card straight flushes 6-9). We use a similar technique (letting our universe of cards be all 82 cards except Green 0’s and Green 5’s) to calculate the number of 4 card straight flushes of numbers 1-4 (and 5-8 by symmetry) is . Again, letting our universe be all 82 cards except Green 1’s and Green 6’s, the number of 4 card straight flushes of numbers 2-5 (and 3-6 and 4-7 by symmetry) is , which gives us a total of 2 ⋅ 136161 + 2 ⋅ 190134 + 3 ⋅ 184626 = 1206468. 3 card straight flush: We use a similar technique as above, although we have to consider the case where we have two non-adjacent 3 card straight flushes separately. Notice that under this technique, the expressions get simpler the fewer cards we have, unlike the technique of subtracting off distributions we overcounted which gets more complicated the fewer cards we have. For 0-2, our universe of cards is 82-3=79, so we get , although we have to subtract the two non-adjacent 3 card straight flushes which is . (these are the same as 7-9 by symmetry) For 1-3 (and by symmetry 6-8) our universe of cards is 82-5=77, so we get , then subtracting . For 2-4 (and 5-7) our universe of cards is 82-6=76, so we get , then subtracting . For 3-5 (and 4-6) our universe of cards is 82-6=76, so we get , then subtracting . Finally, we have to add in the case where there are two non-adjacent 3 card straights. If the first straight is 0-2, the other straight could be anywhere from 4-6 to 7-9, which gives 2 ⋅ 32(3 ⋅ 33 + 2 ⋅ 32). Adding up all such cases gives an additional 2⋅32(3⋅33+2⋅32)+33(2⋅33+2⋅32)+33(33+2⋅32)+33(2⋅32) = 5427 possibilities. This gives a total of 2(1144050-1782)+2(1545075-1944)+2(1479843-1215)+2(1479843-486)+5427 = 11292195. So, the total is 3159 + 87156 + 1206468 + 11292195 = 12588978. You can perhaps do some sort of inclusion-exclusion argument where your sets are the hands that have 3 cards in any particular suit, but it gets very complicated very fast - open to suggestions. You can perhaps do some sort of inclusion-exclusion argument where your sets are the hands that have 4 cards in any particular suit, but it gets very complicated very fast - open to suggestions. 2-2-2 split (i.e. three pairs): If we use the numbers 0 and 9, there are for the choices of the cards of number 0 and 9, 8 choices for the other number, and choices for the cards of that number. If we use only one of 0 and 9, there are 2 choices for which one to use, choices for the cards of that number, choices for the other two numbers, and choices for the cards in each number. If we use neither 0 nor 9, there are choices for the numbers and for the cards in each number. This gives a total of . 2-2 split with no other pair: If we use 0 and 9, there are possibilities for those cards. For the other two cards, they can’t be 0 or 9, so there are choices, except of these lead to another pair, so we subtract them. Similarly, if we use one of 0 and 9, there are choices and if we use neither 0 nor 9 there are for a total of . So, the total is 12646280 + 3367296 + 76431600 = 92445176. 6 of a kind: Since there are only 5 0’s and 9’s, we must be a 1-8, so there are 8 choices for the number and ways to choose the cards of that number for a total of . 5 of a kind: If the number is 0 or 9, there are ways to choose the cards of that number and 82-5 ways to choose the other card. Otherwise, there are ways to choose the cards of that number and 82 - 9 (to avoid picking the same number again) to choose the other card. This gives a total of . 4 of a kind: If the number is 0 or 9, there are ways to choose the cards of that number and ways to choose the other card. Otherwise, there are ways to choose the cards of that number and ways to choose the other card. This gives a total of . 3 of a kind and 3 of another kind: (we break this out separately to avoid overcounting) - we count this in the Full house section, and the result is 211108. 3 of a kind (and not 3 of another kind): If the number is 0 or 9, there are ways to choose the cards of that number and ways to choose the other cards, but we have to subtract off the number of ways to choose another 3 of a kind, which is . Otherwise, there are ways to choose the cards of that number and ways to choose the other cards, but again we subtract , which is the number of ways to choose another 3 of a kind. This gives us a total of . So, the total is 672 + 73738 + 2678284 + 211108 + 42836496 = 45800298. 4 of one number and 2 of another: If the number of the 4 cards is 0 or 9, there are 2 choices for the number, ways to choose the cards in that number and ways to choose the cards in the other number. If the number of the 4 cards is not 0 or 9, there are 8 choices for the number, ways to choose the cards in that number and ways to choose the cards in the other number. This gives a total of . 3 of one number and 3 of another: If the numbers are 0 and 9, there are choices. If one of the numbers is 0 or 9, there are choices. If neither number is 0 nor 9, there are ways to choose the numbers, so there are choices. All together, this gives . 3 of one number and 2 of another: If the number of the 3 cards is 0 or 9, there are 2 choices for the number, choices for the cards in that number, and for the other 3 cards. If the number of the 3 cards is not 0 or 9, there are 8 choices for the number, choices for the cards in that number, and choices for the other 3 cards. All together, this gives . So, the total is 277156 + 211108 + 12158016 = 12646280. 6 odd cards: There are 41 odd cards, so there are possibilities. 5 odd cards: There are also 41 even cards, so there are possibilities. This gives a total of 4496388 + 30725318 = 35221706. Since there are 41 even cards and 41 odd cards, by symmetry this is the same number as 5 odd cards, which is 35221706. 0 and 0: Firstly, we count how many hands have 0 and 0 as their lowest cards. There are total hands, hands that have no 0 cards, and hands with only 1 0, so the number of hands that have 0 and 0 as their lowest cards is . Of these, the only hands that don’t have 3 cards totalling ≤ 4 are those that only have 5’s or higher for the remaining cards, and there are of these, so our total is . 0 and 1: There are 5 choices for which 0 we have, and for the remaining 5 cards there are , and have no 1’s, so the number of these hands is . Of these, the only hands that don’t have 3 cards totalling ≤ 4 are those that only have 4’s or higher for the remaining cards, and there are of these, so our total is . 0 and 2: There are 5 choices for which 0 we have, and for the remaining 5 cards (which have no 1’s) there are , and have no 1’s, so the number of these hands is . Of these, the only hands that don’t have 3 cards totalling ≤ 4 are those that only have 3’s or higher for the remaining cards, and there are of these, so our total is . 1 and 1: There are hands that have no 0’s, but of these hands have no 1’s, and of these hands have exactly 1 1. So, there are hands that have 1 and 1 as their lowest cards. Of these, the only hands that don’t have 3 cards totalling ≤ 4 are those that only have 3’s or higher for the remaining cards, and there are of these, so our total is . Therefore, the total number is 13266257 + 36304935 + 6608040 + 17438748 = 73617980. By symmetry this is the same number as 3 cards totalling ≥ 4, which is 73617980. A skip straight is a 4 card straight where there’s a 1 number gap between each card: i.e. 0 2 4 6, 1 3 5 7, etc. 5 card skip straight: The possibilities are 0 2 4 6 8 and 1 3 5 7 9. For 0 2 4 6 8, there are 5 ⋅ 94 possibilities for the straight and 82 - 5 possibilities for the extra card. However, this double counts cases with a (2,1,1,1,1) distribution of cards in the straight. If there are 2 0’s, there are possibilities, and if there are 2 of anything else there are possibilities. This gives us a total of , and by symmetry the same total for 1 3 5 7 9. 4 card skip straight: We use the inclusion-exclusion technique as described in the 3 card straight flush, specific suit case. For 0 2 4 6 (and similarly 3 5 7 9), our universe of cards is all 82 cards except any 8 (to avoid falling in the 5 card skip straight case), so there are 82-9 = 73 cards in our universe U. We get . For 1 3 5 7 (and similarly 2 4 6 8), our universe of cards is all 82 cards except any 9, so there are 82 - 5 = 77 cards in our universe U. We get . So, our total is 2 ⋅ 1935495 + 2 ⋅ 5452920 + 2 ⋅ 10558836 = 35894502. A mixed straight is a 4 card straight in which each of the cards is a different suit. I’m open to suggestions on how to count this efficiently. This page was generated from the LATEXsource with TeX4ht. calculateprobs.py is the Python script that calculates the exact number of 6 card hands that satisfy each target card. I was intending to use it as just a check on my by-hand calculations, but as the combinatorics got harder and harder I used it as the only calculation for a few target cards. outputgraph.py generates the pretty graph of target cards. It uses matplotlib. compile.sh compiled the source to this HTML page.